I have hstwb-installer_1.3.0-beta1_portable and trying to make a self install image but I can not see any options for 3.1.4, in the workbench I have a choice of 3.1 (2016) or 3.1 (AF 7) or 3.1 Custom, there is no way to select 3.1.4 What am I missing? Thats true, self install images doesn’t use any of the selected Workbench options configured using setup. Building a self install images just copies scripts to detect any supported Amiga OS 3.9, 3.1.4 and 3.1 installation and the packages selected. 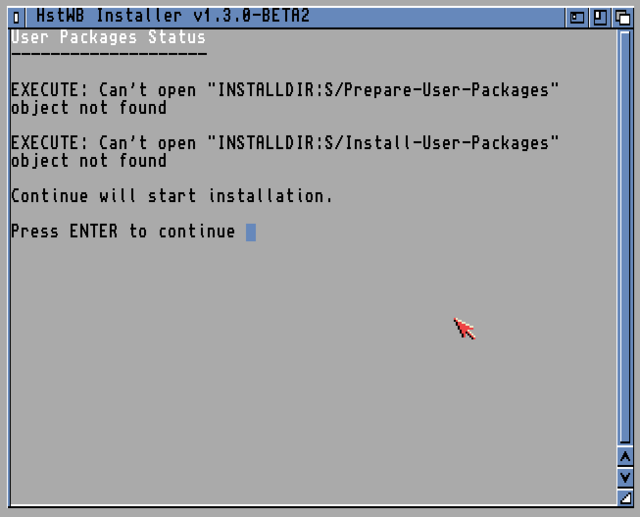 HstWB Installer only depends on A1200 Kickstart 3.1 to start WinUAE or FS-UAE to copy scripts and packages. Running the self install image will detect supported Amiga OS from adf files present in “amigaos” directory. I can see this is quite confusing and I need to change setup to indicate this better. Thanks for giving me insights about this. Next beta version will contain changes to better handle this issue. Nice work, what about 64gb self install images. Do you have any plans to add these again? Sure, 32gb and 64gb prebuild self install images are now available for download. I get these error messages during the installation but it still will install normally if ignored? That's interesting. I can't reproduce the error message and tried with both 4GB and 64GB images. Which image did you use? Did you run hstwb_image_setup script prior to starting the installation? I get the same error messages for all image sizes which I create using the configure image option in the launcher, I tested 2GB, 8GB & 64GB images. The installation will still proceed as normal after skipping these messages though so it's just a little strange. Are you creating images from HstWB Installer launcher and setup, which causes these errors? Could you try with one of the prebuild self install images from https://hstwb.firstrealize.com/download? Yes, I'm using the launcher, setup, configure image, create image option in the "hstwb-installer_1.3.0-beta2_packages_portable" folder to create images. Can I add these prebuilt self images into the root folder and proceed from there? They can be downloaded, extract anywhere and run regardless of HstWB Installer is installed or not. The prebuild self install images work ok. I no longer get any error messages with any sized image using that method.